Surah Duha was one of the earliest surahs to be revealed by Allah subhana wa ta’ala to the Prophet sallallahu alayhi wasallam. It was sent at an especially tough time for the Prophet. Revelation had stopped for nearly six months, and the Prophet had become restless. The Quraysh were saying that Allah had abandoned the Prophet, naudhubillah. The Prophet had become depressed and sad, and Allah then sent this surah and the surah after this, Surah Inshirah, to console the Prophet sallallahu alayhi wasallam. Let us have a look at some of the lessons that this Surah teaches us. 1. Even the Prophet sallallahu alayhi wasallam got sad. Sadness and happiness are human emotions that Allah subhana wa ta’ala has created in us and placed in us. Allah knows that, and Allah doesn’t expect us to always have one set of emotions for life. It is okay to be happy, and it is okay to be sad. Unfortunately, some Muslims see happiness as a negative— we should only be worried about the life of the hereafter. How can you be happy when you might be going to hell? On the flipside some Muslims see sadness as a lack of imaan, a sign of discontent with Allah’s decree, etc. However, the best of examples to us was the Prophet sallallahu alayhi wasallam and he was sad, and he was happy. It is not the emotion, but rather how we deal with it. The need for happiness doesn’t allow us to drink wine, party like a madman, and disobey Allah. Similarly sadness doesn’t allow us to break things, shout at other people, or wail and hurt ourselves. We are faced with differing circumstances and emotions in life, and it is how we react to it that makes the difference. The Prophet’s reaction to both would be to remember Allah. In good times he thanked Allah, and in harder times He sought the help of Allah— the best of examples. The Prophet got sad because he was not getting a communication from Allah. He missed seeing Jibreel, he missed being given Quran, he missed reciting new verses to his Sahabah and very importantly, he felt he might not be able to save his people from hellfire if he didn’t receive more ayaat from Allah. 3. In bad times remember the good that Allah has bestowed. 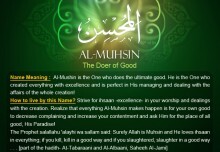 Allah reminds the Prophet sallallahu alayhi wasallam of the blessings that Allah had always given upon him. How Allah sheltered the Prophet when he became an orphan, first through his grandfather and then through his uncle. Allah mentions how the Prophet was in need and Allah made him self-sufficient through the marriage with Khadijah radi Allahu anha. Allah also mentions how the Prophet was seeking a way out of the filth of society and Allah guided him, through the Quran. Psychologists today help patients suffering from depression, low self-esteem and suicidal tendencies by asking them to count their blessings, and Allah azza wa jal is reminding the Prophet of the blessings that he had been given, and how Allah changed his condition from bad to good, and how Allah can do so again, as He promises 4 and the future will be better for you than the past; 5 your Lord is sure to give you so much that you will be well satisfied. Ramadan is a month of great barakah. You too can learn to understand the Quran, and benefit from it and understand it. Perhaps then you would not be reading this article, but rather writing one like it or even better! Join one of the UnderstandQuran courses, whether you are just learning to read the Quran, learning 50% of Quranic words or if you are placed better than going forwards to the 70% of Quranic words course! 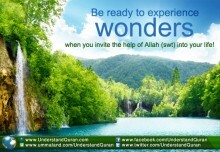 Invite Allah’s Help— and Experience Wonders! ghazalamubushar July 25, 2014	Log in to reply.